I’m not usually one to trespass. I’m a clean-cut, straight-A-student kind of guy. 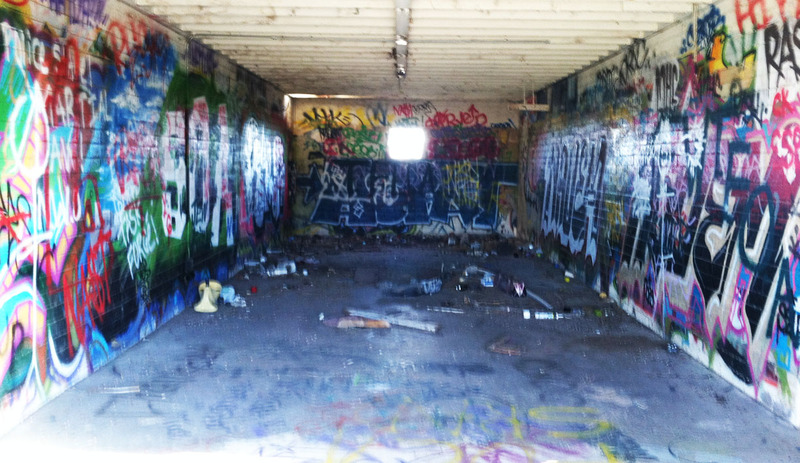 But deep down inside of me, I’ve always liked exploring buildings that are off-limits. I guess part of the thrill is that of potentially getting caught. One of my favorite adventures recently was exploring an old deserted ghost town called Modena, Utah in fall 2012. 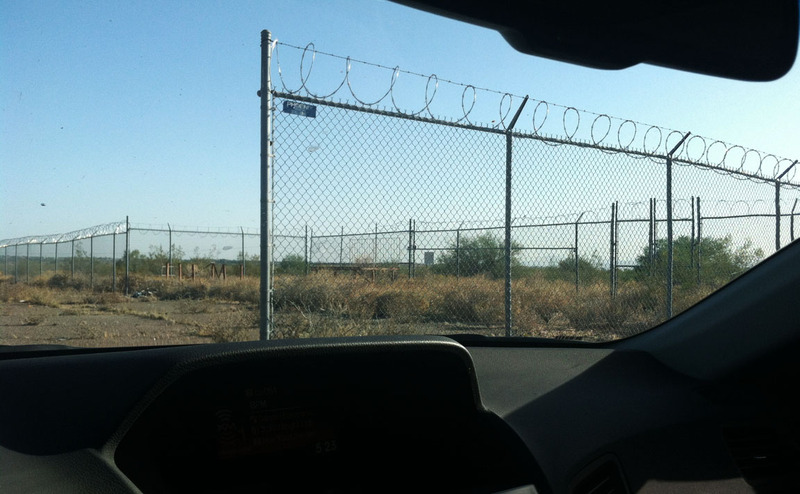 For 5 years now, my weekday afternoon commute has taken me through the Salt River – Pima Indian Community. Daily I’ve passed within 50 yards of this looming 3-tiered abandoned structure south of the Beeline Highway, but I’ve never taken the time to dig deeper — until yesterday. I decided to finally see if it was even possible to access the building. I hit the brakes in the ILX and took my next left-hand turn. Just before entering the driveway of an abandoned double-wide trailer, I veered onto a one-lane dirt road and pointed the car toward the concrete building to the east. I could tell that the road at some time was paved, but decades of aging had returned it almost completely to earth. I dodged a couple of huge potholes. Soon, I saw that the square building had a 10-foot-tall chain link fence all the way around it (and barbed wire looped around the top). Except, there was an opening just wide enough to drive through. It was too tempting to resist. 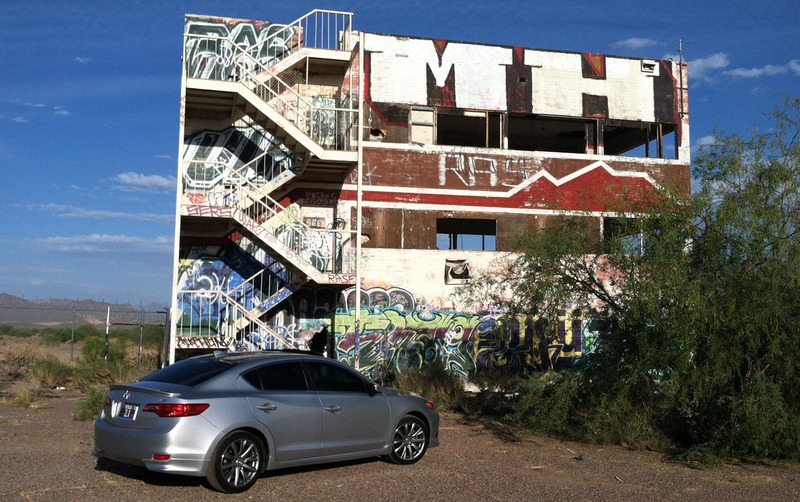 I pulled the ILX into the fenced-off area and hopped out for a few pictures. One step out of the car and noticed the pavement was glistening in the sunlight. “Crap,” I thought. 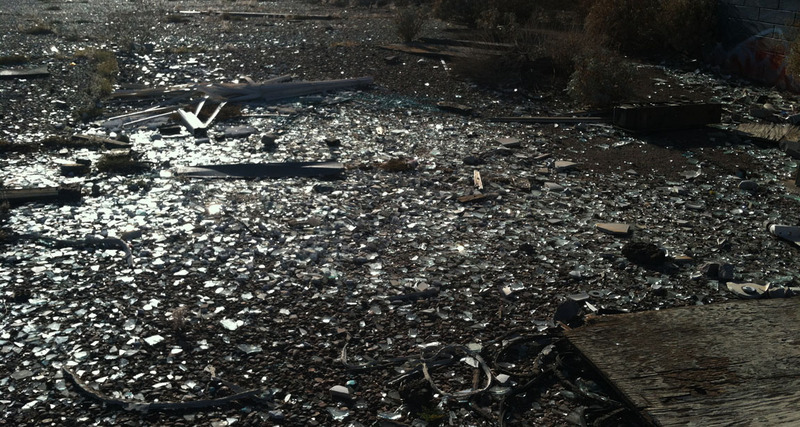 The entire ground was absolutely covered in shards of glass from broken bottles. I was hoping my Michelins would hold on. And they did. I hurriedly took a couple of shots with my cell phone since my Nikon was at the house. The north end of the building at the ground level was totally open, so I peeked inside. 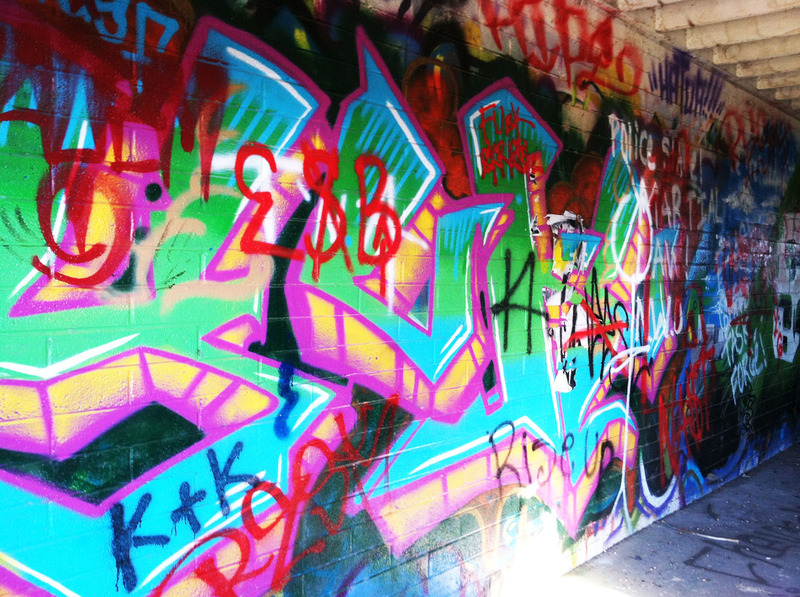 Elaborate graffiti artwork adorned every surface, and a few stray pieces of garbage at the far end of the room were probably someone’s furniture at one point. I didn’t take the time to climb the staircase and view the upper floors of the building, but I’d like to go back – and armed with a better camera. So what is this place? 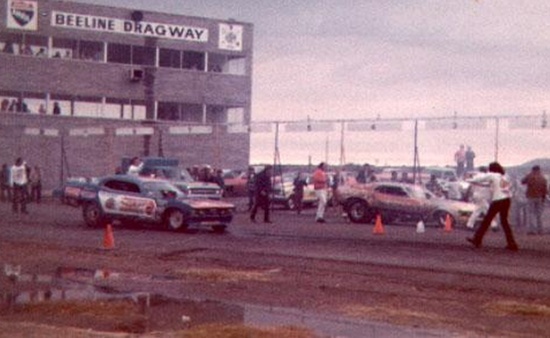 Its history dates back to 1963 when it was known as the Beeline Dragway. 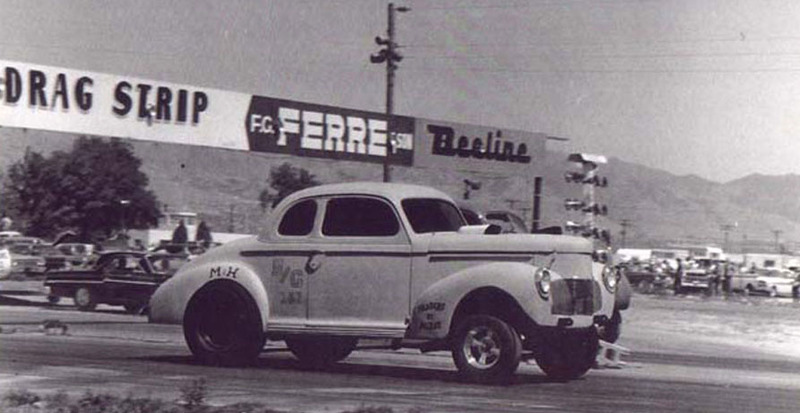 It was opened that year as a 1/4-mile drag race track. In those days, races were held on Saturday nights in the summertime and on Sundays in the winter – with some cars hitting speeds up to 200 miles per hour. The raceway has been closed since 1975 when the lease expired with the Indian community. It has since been replaced by larger, much more modern facilities elsewhere in the valley including Phoenix International Raceway (PIR) and Wild Horse Pass Motorsports Park. Unfortunately, today there’s not much left of the Beeline Dragway. 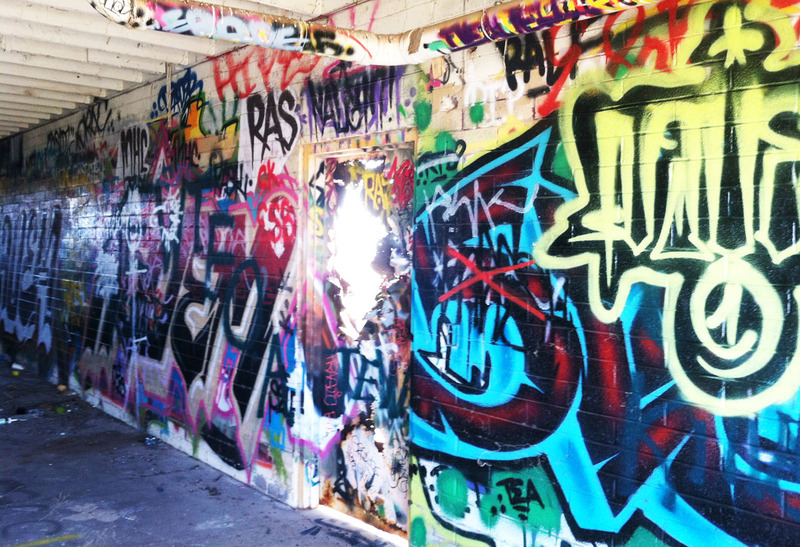 Some 40 years after its closure, the only memory of Beeline that still stands is this graffiti-tagged main building. Here’s an overhead view of the area. Beeline Highway is along the top, with the lone building in the center of the screen as the structure which I entered. The track itself extended horizontally toward the east from the main building. I like to think about what the reaction would have been if, 50 years ago, I pulled up at Beeline Raceway in a 2013 Acura ILX. For the 12 years that it was open, this building was witness to the height of the muscle car era. I found this really neat video from 1969 when the Beeline was at its heyday. 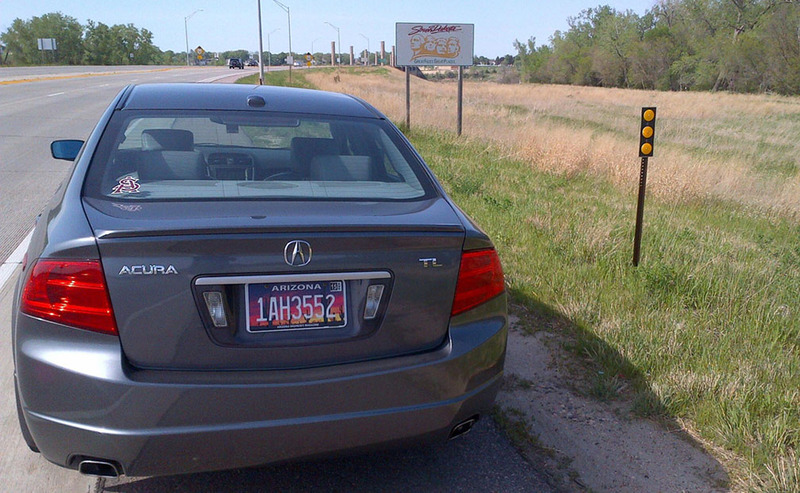 Thanks to D25 reader Ryan for sending me this pic of his TL arriving in his home state of South Dakota. Nothing like a little road trip to kick-start the summer. And a huge congratulations to our Italian reader, Francesco, on hitting an impressive 320,000 kilometers in his Fiat! Thanks to all of you who continue to share your milestones with me. Keep ’em coming. 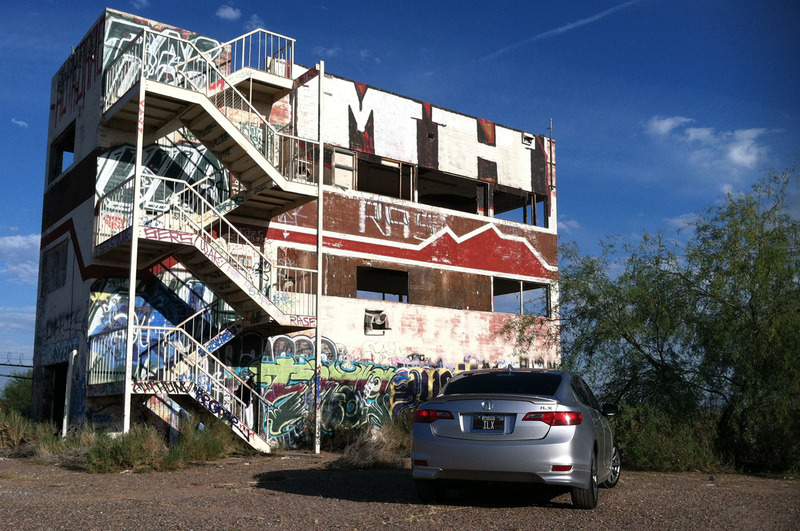 This entry was posted on May 21, 2014 at 9:02 pm and is filed under Arizona, Ghost Town, ILX, Road Trip. You can follow any responses to this entry through the RSS 2.0 feed. You can leave a response, or trackback from your own site. too cool (and too bad) to see the older race areas. Funny how the main building you would never picture for a central official building until you see the past pictures. Agreed – I should’ve stopped by years ago but never took the time to investigate it. It was great to learn that the building was car related. Wish they’d open a track back up out there. It’s not far from my house. 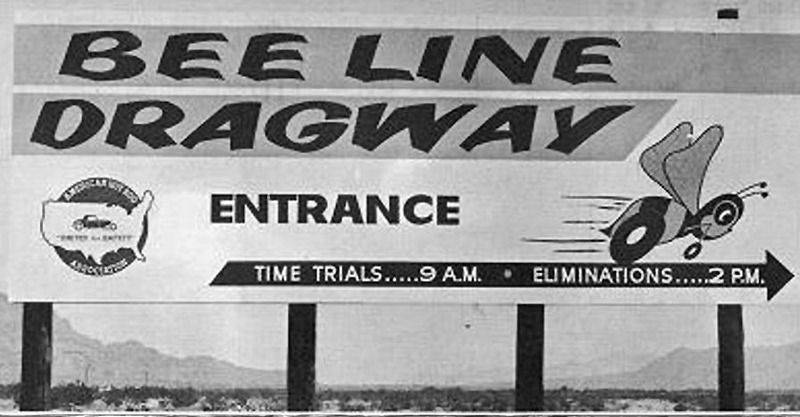 I have read all about BEELINE DRAGWAY. I have seen and heard that it closed in 1975, That is not true. I went to my high school drags there in 1978. I also went to the mud bogs in 1979 when mr. chandler brought out his 1979 huge blue truck call “BIGFOOT”. 1980 they had motocross track opened. very soon that year it did close. That’s good to know, always nice to get a firsthand account of the timing. I wish it had kept around because it would be fun to have a nice little track like that to hit up on weekends. I wonder what ever happened to Bigfoot.